Combining the best features of a bar stool and a chair, the Chateau Bar Stool Grey is a deluxe model with an undeniably sophisticated look. Refined in style yet incredibly comfortable, the Chateau is an ideal choice for those seeking a luxurious piece. 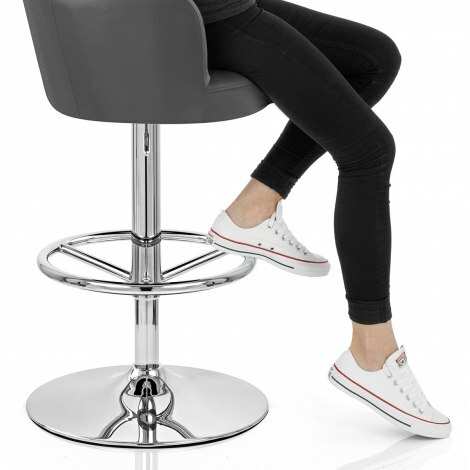 Featuring rounded armrests and a tall backrest; it offers all the support of a chair, at convenient bar stool height. 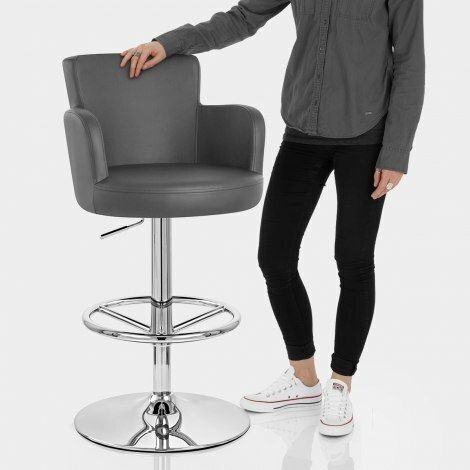 The entire seat is filled with high-density foam for a comfortably cushioned feel, and covered with grey faux leather, lending this model a truly elegant aesthetic. Chrome-plated, the frame incorporates both a gas-lift and 360-degree swivel movement, so that you can tailor this model to suit you. Plus, a circular footrest is affixed to the frame, at just the right height for perching your feet upon. A rounded base supports the Chateau, with a built-in floor guard, designed to help to avoid damage to all floor types. "Look good and match my new kitchen perfectly"
Kitchen stools for breakfast bar found at last! So happy to have found stools that are comfortable, look good and match my new kitchen perfectly. The care taken in packaging was excellent ensuring my stools arrived in perfect condition and in good time. Your delivery couriers DPD also perfeormed very well! All in all a great find in a minefield if lesser stools on the market! Thank you. Firstly I should mention the excellent quality of service by Atlantic Shopping. Delivered next day free of charge with a one hour time slot. One stool had a minor defect (thread missing in the base). I called Atlantic, got through immediately and was promptly offered an exchange to be delivered / collected on any day of my choice. The stools themselves are of exceptional quality. Very comfortable. Great back support. Perfect for our new kitchen island. Would highly recommend. Quality excellent. The delivery was next day to the highlands of Scotland at no extra charge. Stylish, suits our new kitchen. Initially ordered 2 but ordered a 3rd once built.